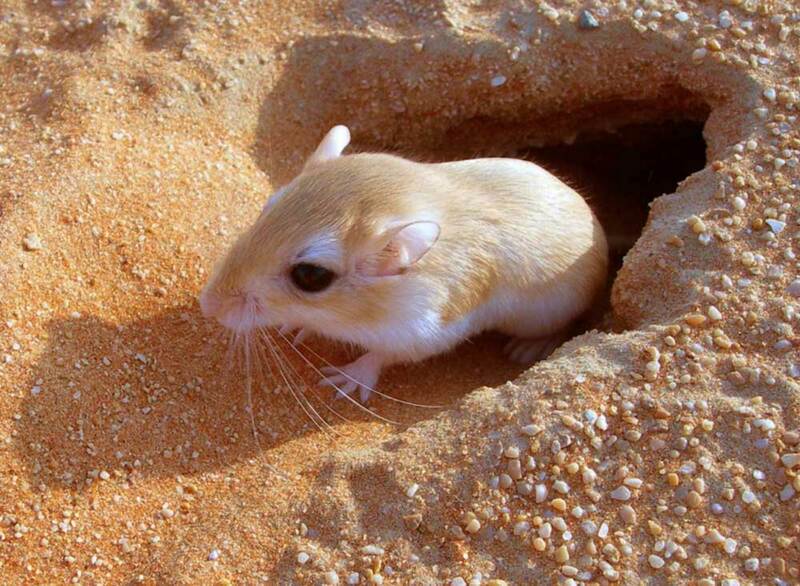 Cheesman’s Gerbil tends to live in sandy desert areas and sand dunes, and is nocturnal. They tend to be solitary and dig deep burrows at the base of grass clumps or shrubs. These burrows may have 3-4 entrances to facilitate escape. They mainly breed in winter when there is plenty of food. It feeds on desert plants and seeds. Its gestation period lasts three weeks, usually resulting in 6-7 babies. In Qatar, they are found in sandy deserts. Cheesman’s Gerbil is a medium sized gerbil species with a soft and silky coat. The dorsal side is a reddish orange. The cheeks are white, and there are white spots above the eyes and behind the ears. The undersides and lower flanks are pure white, clearly demarcated from the dorsal colour. The eyes are large and black. The long tail is reddish above, at least at the base, and the terminal tuft is absent or very sparse. The palms and soles of its feet are covered in fine white hairs.